A specter is haunting the planet–the specter of climate change. Millions of young people recently marched in the streets to demand immediate action to save the planet. Whether you agree that humanity has 12 years to prevent a climate catastrophe or believe that “global warming” is a communist plot that will plunge us into civil and/or global war, the fear is palpable. Humans need to figure out what we are going to do about CO2 emissions. The simplest and safest way to solve our problems is with a Green Nuclear Deal. Mark Schneider, a retired Navy nuclear technician, was the first to use the #GreenNuclearDeal hashtag. Schneider, who understands the latest technology, argues that new reactors solve the two biggest problems associated with nuclear power in the past. First, the new “Gen IV” reactors cannot melt down in the way older reactors could. Second, Gen IV reactors consume the reactor byproducts that were such a problem with older designs. Twentieth century nuclear waste can be radioactive for 100,000 years. Gen IV wastes are only reactive for about 300 years. Americans who don’t know about the Gen IV breakthroughs are evenly balanced on the subject of nuclear power. 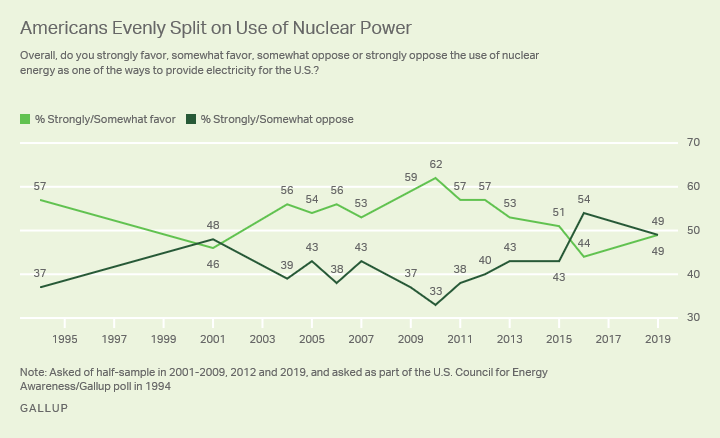 Support for nuclear power is not a particularly partisan issue. While Republicans may be more eager for it, 42% of Democrats and Independents favor it. That is good news for a nation with divided government–Nancy Pelosi’s House of Representatives and Mitch McConnell’s Senate may be able to agree on a bipartisan plan that actually solves problems and saves money. Gen IV reactors are dramatically safer than twentieth century models, but even a perfect reactor can be affected by outside events. Any nuclear installation needs to be protected from terrorists, tornadoes, tsunamis, and other foreseeable threats. That is why the first new installations on US soil should be on existing military bases. Step 1 of the Green Nuclear Deal is for the President of the United States, acting in his capacity as Commander-in-Chief, to order every US military installation to develop a plan to acquire all electricity from an emissions-free source within a reasonable time. Depending on state and local laws, some bases may be able to install small modular reactors to achieve this goal. These “Green Guard” reactors shall be used to power the base and provide free power for all residential consumers within a radius of 10 miles. Any excess electricity during peak demand hours shall be sold to electric utilities at a fair rate. During off-peak hours, these Green Guard reactors shall be used to run desalinization plants, carbon capture units, hydrogen electrolyzation plants, or other environmentally useful, energy-intensive projects. Funding for the Green Guard may come either from an allocation of federal funds or by means of federally-guaranteed private sector financing. Personnel for the Guard shall be actively recruited, trained, and retained (nuclear power operators are in high demand now and will be in much higher demand). The President shall ensure that this project is headed by individuals with demonstrated success in projects requiring rapid expansion, as authorized by Executive Order 12344. At the risk of offending members of the Army, which effectively “owns” the color green, the United States can and should build a new generation of nuclear-powered ocean-going vessels to “wage war” on CO2 emissions. Title VIII of the Fiscal Year 1975 Defense Appropriation Authorization Bill requires, as a matter of policy, that new construction on “major combatant vessels for the strike force of the United States Navy” be nuclear-powered. This Title allows the President to request conventionally-powered ships instead of nuclear-powered ones. Citing this authority, the President, acting as Commander-in-Chief, should immediately order the design of an ocean-going vessel capable of housing a small modular reactor and a sufficient contingent of Marines to protect that reactor from all enemies, foreign and domestic. These vessels should be designed for sufficient economies of scale to make them a cost-effective platform for portable power stations. Carbon capture technology can now pull CO2 out of ionized seawater, which can then be used to create jet fuel for about $7/gallon. The President should instruct the Navy to design a new class of nuclear-powered tankers to support aircraft carriers. If the technology permits, these tankers should eventually supply all the fuel needed for conventional vessels, too. The President shall also instruct the Secretary of the Navy to contract with civilian owners of container ships to lease such ships and configure them to carry a small modular reactor and housing for enough troops, specialists, and construction workers to implement the Green Marshall Plan, below. While the Navy is developing Green Fleet vessels and US military bases are using small modular reactors to safely provide power to consumers in the United States, the President shall order the State Department to consult with friendly, stable, developing nations to determine which, if any, are willing to harbor Green Fleet vessels carrying small modular reactors. The Green Marshall Plan is intended to help friendly, stable, developing nations become more friendly to US interests, more stable politically, and more likely to develop their own industrial infrastructure. Power shall be sold to consumers at a fair market rate, in order to generate revenue for American citizens (see below) and to prevent disruption within the developing nation. The Green Marshall Plan is intended to retire aging and inefficient local power plants and to attract new development to sources of safe, clean, reliable power. The Green Marshall Plan is primarily intended to wean developing nations off the “dirtiest” forms of energy, but is also intended to relieve the human suffering associated with lack of economic opportunity. Many Mexicans and Central Americans have left their homelands in order to seek a better life in the United States, whether they have entered the US legally or not. The President shall instruct the Secretary of State to give special consideration to undocumented Mexican and Central American nationals who voluntarily leave the US to work at a Green Marshall Plan site in their home country. All Green Marshall Plan sites shall be designed to transition to fusion power when and if that technology becomes available. The intent of the plan is to hand over the assets to the developing nation as soon as the power source cannot be used to manufacture weapons, including dirty bombs. At that point, the original fission reactor shall be removed from the site, all nuclear wastes removed from the premises, and control of the operation shall be turned over to the citizens of that nation. The Green Marshall Plan may be funded in part of whole by carbon tariffs imposed on goods imported from advanced economies that culpably neglect or refuse to address their own CO2 emissions, as determined by the President. Nuclear waste consists of a relatively small amount of radioactive material mixed in with a vastly larger amount of harmless material. On a small scale, it is most economical to warehouse these contaminated materials. In theory, radioactive materials can be separated from inert isotopes similar to the way that rare earths are separated from the material around them. We can build a “disassembly line” that removes one element at a time from a stream of contaminated material. The President shall order the Department of Energy to authorize the creation of several regional Nuclear Waste Transfer Stations around the country, each of which shall be designed to use pyrochemical methods for separating actinides and fission products from nonradioactive components. The hazardous materials shall be shipped to a Nation Greencycling Center; the inert materials shall remain at the transfer station, where they shall be monitored for safety on an ongoing basis. The National Greencycling Center shall be designed to study and process concentrated nuclear wastes. Mass spectrometers are capable of separating materials into their separate isotopes, one atom at a time, but use a great deal of power in the process. The National Recycling Center shall be equipped with at least one small modular reactor for its own power needs, and as many breeder reactors as the Secretary of the Department of Energy may deem necessary to permit the study and processing of concentrated nuclear wastes. No matter how safe nuclear power may be, it may continue to affect the property values of the people who live near a reactor. Even if one believes that nuclear power is the only effective way to reduce CO2 emissions to net-zero or less, it seems unjust to force some people to bear an unfair share of the economic costs of that action. There is no way to eliminate the psychological impact of a nuclear reactor in one’s neighborhood, but it is possible to axtually boost the property values around reactors. The President shall ask Congress to enact legislation creating “Green Enterprise Zones” within the “emergency planning zone” (“EPZ”) surrounding each new domestic nuclear reactor. The President shall ask Congress to draft and pass legislation that will create sufficient federal tax incentives to raise property values around each new reactor. The reactor shall provide free electric power to all residential consumers, free electric vehicle charging stations at all parking lots serving retail stores, and free or reduced-cost electricity to all industrial consumers within the EPZ. In addition, every new civilian reactor shall be required to carry sufficient “Greensurance” to guarantee that in the event of an emergency, (1) every home and business within an EPZ shall be bought for three times its fair market value, (2) every person located within the EPZ at the time of the emergency shall receive free medical care for life, and (3) every radiation-related death (whether in the EPZ or beyond) shall be immediately compensated by $1M. With these incentives in effect, industrial and commercial users should flock to these Green Enterprise Zones. Shoppers from miles around will drive to a store where they can recharge their electric vehicle for free. Energy-intensive industries should flock to free electricity and lower taxes. Rich people will be eager for the tax breaks, working class people will want the jobs. People who were raised with the specter of nuclear war and other disasters may never get over those fears, but they will be able to sell their real estate for a handsome profit. Meanwhile, people all over the world will be able to breathe easy, knowing that we are on track to lower CO2 levels instead of raise them. Depending on the success of the Green Defense Project and the Green Marshall Plan, Congress may choose to invest additional federal funds into nuclear energy and related infrastructure. It is impossible to project the total federal expenditure at this point, but it will be well below the $93 trillion that some claim the competing “Green New Deal” would cost. And unlike the Green New Deal, every dollar spent on the Green Nuclear Deal intended to be an asset that pays actual cash dividends to the American people who invest in it. All federal funds invested in the Green Nuclear Deal are intended to serve as an investment in America’s future and the planet’s health and safety. The President shall order the Department of the Treasury to treat all federal expenses and resulting revenues as a “profit center,” and assign an equal share of the net profits, if any, to the Social Security account of every living, lawful resident of the United States plus all overseas military personnel. The Green Social Security account will ensure that these expenditures will return to the taxpayers with interest. Unlike the “Social Security Trust Fund” concept of earlier generations (which was never more than an accounting device), the Green Social Security program will invest in physical assets that will generate actual profits for generations to come. Without limiting the ultimate amount of investment that Congress may ultimately choose, the budget for the Green Nuclear Deal shall be set at $20,000 per US citizen, which is just over six trillion dollars. At a reasonable rate of return, this should pay $1,000 into every Social Security account every year. While this falls well short of Presidential Andrew Yang’s proposed $1,000/month “Freedom Dividend,” the “Green Social Security” account has the advantage of being fully funded and completely sustainable. The National Energy Leadership Act, sponsored by Alaska Senator Lisa Murkowski, has fourteen co-sponsors in the US Senate. Among other useful items, this bill invests in training for a new generation of nuclear engineers and power plant operators, which is essential for any serious transition to nuclear power. With 15 Senators sponsoring a bill with such broad, bipartisan support, it should be able to get the 60 votes necessary to survive a filibuster. As of this writing, there is no companion bill in the House of Representatives. For the next 15 months, Democrats will be competing to demonstrate their courage, intelligence, and leadership. Climate change is at or near the top of every candidate’s priorities. With so many candidates competing for attention in such a crowded field, it makes sense to support a plan that appeals to 42% of Democrats who already favor nuclear power. At present, Sen. Cory Booker of NJ is the only announced presidential candidate who is a co-sponsor of NELA (see above), but Michael Bennet of Colorado may yet enter the race. Sen. Amy Klobuchar has been reported to support nuclear power, but has not yet indicated her support for NELA. Andrew Yang openly supports nuclear power. Nobody knows who will control the House, Senate, or White House in 2021. If the Green Nuclear Deal becomes a grass-roots, bipartisan effort, it won’t matter. Cheap, clean, plentiful power is a win-win approach. Let’s start winning now! Search for and “Like” a tweet with the #GreenNuclearDeal hashtag. Write your own #GreenNuclearDeal tweet. Recruit a friend and ask him or her to repeat steps 1-5. Contact your two US Senators and ask them to co-sponsor NELA. Contact the Democratic presidential candidate of your choice and ask him or her to support the #GreenNuclearDeal. With an investment of approximately six trillion dollars ($20,000 per citizen), the United States can insure domestic tranquility, provide for the common defense, promote the general welfare, and secure the blessings of liberty for ourselves and our posterity. We can build a system that powers our future and pays real cash dividends to every citizen. We can banish the fears that keep our children awake at night. Next Next post: How Can I Support the #GreenNuclearDeal?